Price. Usenetserver is the better way to get cheap Unlimited Usenet-access. One year at only $95.40 which comes out to $7.95 per month. Direct Tier-1 Usenet access (not reseller access). UsenetServer is a Tier-1 Usenet provider. When you connect to their servers, you’re plugged directly into their backbone which includes multiple redundant server farms throughout North America and Europe as well as a massive, multi-petabyte newsfeed. NZB search engine. UsenetServer uses Global Search, an NZB search engine similar to Binsearch - with excellent results. Global Search feature is a nice addition. The service actually allows you to search all the binary newsgroups across their full range of binary retention, and find binaries, generate NZBs and download them with the Newsreader of your choice. 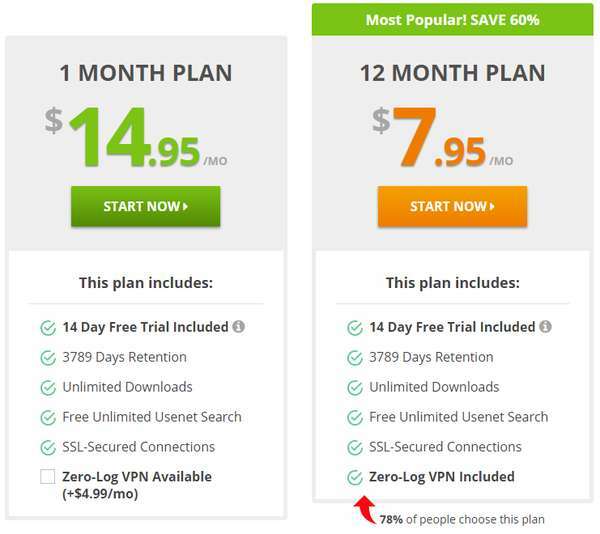 Free VPN included with the annual rate. It is a real advantage to have a VPN since it allows users to have Usenet as a primary source for files, but to make use of another network if necessary. In our case, UsenetServer VPN could be using for torrenting. The best torrenting programme is VUZE since it has an IP Bind in its options. UsenetServer offers not only a low cost access to Usenet but also a very high quality of service. Its completion level for the most recent posts is very good. I never had any completion issues with them. The combination of UsenetServer with good NZB sites and/or automation tools will give you very high completion. Many files posted to Usenet nowadays have obfuscated file names. These files have obfuscated names in order to hide their content. This makes public Usenet search engines (Binsearch - Nzbindex) useless and requires joining one or more NZB Sites to get the NZBs for obfuscated releases. Today obfuscated files have made download errors extremely rare on Usenet. Your chances of completing the download with the Stealth version of Usenet is excellent. Speed: The 3 servers from UsenetServer will let you use the maximum of your bandwidth (3 server locations – USA news-us.usenetserver.com – NL news-eu.usenetserver.com – DE news.fr7.usenetserver.com). we tested UsenetServer via Hyperoptic 1Gb Fibre Connection, the highest-speed available in the UK. Speeds were excellent as well, we were consistently able to download binaries at 800Mbps. UsenetServer is a very good deal. We strongly recommend UsenetServer's two Unlimited specials: $14.95/month or $95.40/year for life (Comes to $7.95 per month !). Compared to its competitors, UsenetServer is miles ahead with this newsgroup offer. If you are not convinced yet, UsenetServer will offer you a 14 day/10 GB free trial. A credit card or PayPal account is needed to register, but cancel anytime and no charge will be made, no questions asked. One special feature of UsenetServer is the “global search”. UsenetServer’s Global Search allows users to quickly and easily search the binary newsgroups for articles that match their search keyword criteria, select the desired results and then generate a custom NZB file to download the binary articles. With Global Search, you can also filter articles by post age, post date and poster name. UsenetServer’s Global Search is available to all UsenetServer users. UsenetServer offers Usenet access at a very competitive price. We were impressed with UsenetServer’s high completion rates. There are no extras like a bundled Newsreader but you can use free Usenet binary downloader such as SABnzbd or NZBGet. We recommend SABnzbd, a free option that runs in your browser and is easy to set up. UsenetServer is also compatible with all popular Usenet automation apps like Sonarr and CouchPotato. Users of Couchpotato, Sonarr or Sickbeard that make their downloading automatic will be very happy with UsenetServer.